Reference number for this case: 5-Oct-54-Paris. Thank you for including this reference number in any correspondence with me regarding this case. A cardboard-box salesman, Pierre Allo[? ], told Paris reporters that he spotted a huge silver saucer in the sky round 4:30 p.m. yesterday as his taxi stopped for a red light near the Porte Dorée, at the eastern outskirts of the city. Two other persons, Gilbert Bacon and Paul Julien, reported seeing the same thing but thought it looked more like a flying wing. All witnesses spoke of a screeching sound and a smoky tail which followed the object. These were the last reports of out-of-this-world manifestations which have been pouring in from all parts of France for the last two weeks. A Deputy in the National Assembly has asked the Air ministry what it is doing to explain the so-called phenomena. From Lille, it was reported that a retired miner, known as a local wag, had fabricated some hot-air balloons three yards in diameter which went aloft with the aid of gasoline-saturated straw attached to the bottom. When the balloons went up and got caught in the wind they gave off a yellowish flare, to the consternation of people who saw them in the middle of the night. Unfortunately for the jokster, one almost set a haystack on fire on landing, and the miner was arrested. He is charged with what French law calls "dangerous amusement." A road-mender in middle France also was caught for playing a joke. He had reported seeing a flying cigar alight in a field near his work, and claimed that when he approached the object he was paralyzed by a strange light. Afterward he pointed out three holes in the ground which he said were made by the object. Gendarmes picked him up a couple of days later and perceived that the holes had been made by the road-mender's own hands. He was held for further disciplinary action. Lille, France, Oct. 5 (Reuter). Now to make a "flying saucer," you take some strong gray paper and fashion it on the fire-balloon principle. Then you light some kerosene-soaked rags, and the warm air lifts the burning "saucers" off into the winds. That's how you get the orange and yellow lights. That, at least, is the way a retired miner of Beuvry-les-Bethune village did it, police said tonight. And that may account for at least some of the hundreds of "flying saucers" reported in the sky here recently. They said the miner, whose name was not disclosed, claimed he made over 1,000 of these "saucers" as a joke. Police found him out after one of his gadgets landed near a haystack and nearly set it on fire. But the "saucer sightings" go on in France - and not only around Lille. Several Parisians reported seeing a "flying saucer" over the capital today. A traveling salesman, Pierre Allouis, who saw it from a taxi, said it was a big silverish disk which made a loud whistling noise. Painter Gibert Bacon said he saw the same "saucer" but described it as triangular shaped, like a flying wing. The two authors indicate that in Paris, on October 5, 1954 at 04:30 p.m., several people observed a "disc larger than a normal plane and of silver plated color." According to one of the observers, it could have been a "flying wing." The authors indicate that their source is La Montagne for October 6, 1954. 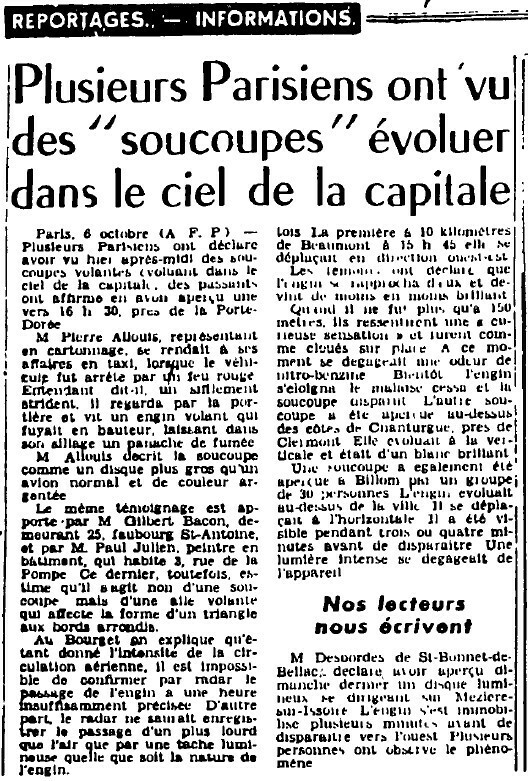 Luc Chastan indicates that in Paris on October 5, 1954 at 16:30 hours several people observe a "disc larger than a normal plane and of silver color". According to one of the observers, it could have been a "flying wing". Luc Chastan indicates that his source is "Ovni, Premier dossier complet... by Figuet M./ Ruchon J.L. ** Alain Lefeuvre pub. 1979". Not looked for yet. Possible jet. 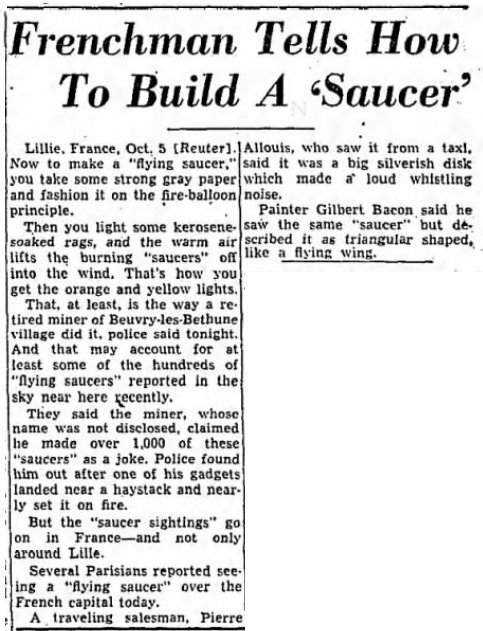 [ny1] Article in the foreign newspaper The New York Times-Herald, Paris issue, October 6, 1954. [bs1] Article in the foreign newspaper The Baltimore Sun, Baltimore, Maryland, USA, page 6, October 6, 1954. 0.1 Patrick Gross September 11, 2005 First published. 1.1 Patrick Gross October 29, 2016 Addition [er1]. 1.2 Patrick Gross January 4, 2017 Additions [pc1], [ub1]. 1.3 Patrick Gross September 16, 2017 Addition [[bs1].